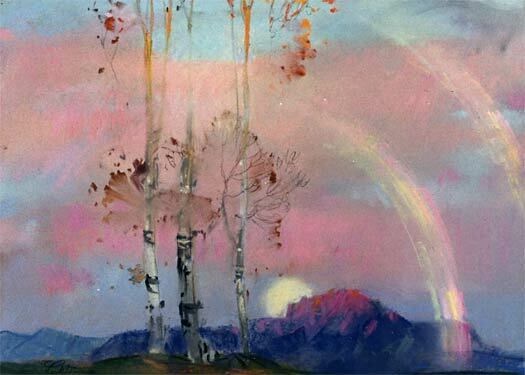 Bio: Arny Karl (1940 - 2000) was a pastelist who played an important role in the revival of plein-air painting in southern California in the 1980s and 1990s. A student of Theodore Lukits (see following post), the Italian-born Karl continued the tradition of working directly from nature in the pastel medium that Lukits began in the 1920s. Karl began painting out of doors in the late 1960s and early 1970s, but did not begin exhibiting his work professionally until the late '70s. He also became an important mentor to now-prominent painters like Peter Adams (b. 1952) and Tim Solliday (b. 1952), who made some of their first outdoor painting trips with Karl. The main emphasis in Karl's work was always to capture the unique mood that he saw before him. He was always drawn to nature's more transient effects - the colors of an intense sunset reflected on the face of a cliff, the blue mood of evening or the dramatic effects of a lightning storm. Arny Karl died too young, but his legacy was his embrace of nature's fleeting moments. Style: Representational. For me there is a 1930s feeling about Karl’s work, which is not to diminish it in any way, but it does seem part of art history. Navigation: I don’t know who maintains this website – the contact page comes up with an error 404. There is a refereence to a 2008 exhibition, but I strongly suggest you view these pages while they are still online. 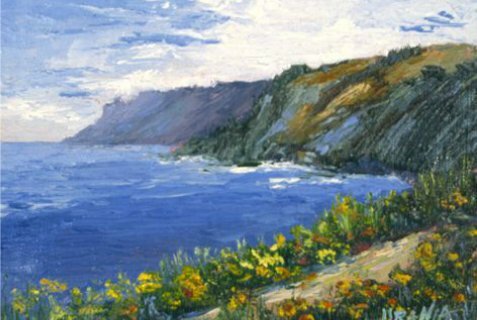 Gallery: Karl’s Art: Coastal Views; Mountain Scenes; Desert Vistas; Southern California; Other Subjects. Image View: Each gallery opens on a new page, where you must scroll from end to end to view the paintings – either use the scroll bar, if visible, or the left/right arrows on your keyboard. Titles and dimensions are mentioned. Download is possible. Navigation: Seems that the website has not been updated since 2008. Bio: Cushla Naegele art studies began in High School at the Fiorello LaGuardia High School of Music and Art, followed by The Art Student's League, Cornell University College of Art, Architecture and Planning, The New York Studio School of Painting, Drawing and Sculpture, and she received my MFA in Painting from Brooklyn College, City University of NY. Her pastel work is entirely self-taught, her influences ranging from Degas to Lautrec - primarily in the sense of what they were able to achieve with the medium. Medium: Pastel. Oil. Charcoal. She draws with chunky black charcoal and delicate pastels on a variety of supports - most often paper, either hand primed with ArtSpectrum pastel primer or not. She favours Rembrandt, Schminke and Unison pastels. Naegele says: The process captivates me, watching as faces emerge from the raw materials of compressed dust and gum Arabic and the energy of my hand and arm, filling a blank two-dimensional space. This quote reminds me of a poem by Lawrence Durrell: ...surely you won’t ever/Be puzzled by a poem or disturbed by a poem/Made like fire by the rubbing of two sticks. (To Ping-Kû, Asleep). Subjects: Landscape; Figurative. Naegele regards these subjects as interchangeable. She views landscape as a form of portraiture of local topography, geology, and geography as well as roads, fences, and cultivated fields. Her portraits of locations led to portraits of people, representations of a moment in the subject's life, the geology of an emotion, geography of a countenance, the structure of a piece of jewelry, a hat, a collar. Navigation: A bit odd in that you can access the portfolios from the home page, but the galleries are not accessible from the information page although the links are still there at the top of the page. Gallery: Portfolios: Portraits – Pastel; People – Charcoal; Landscape – Oil; Landscape – Drawings. Image View: Galleries open in new page. Thumbnail images are enlarged in a viewer; download is blocked. Information is not provided on medium or dimension. 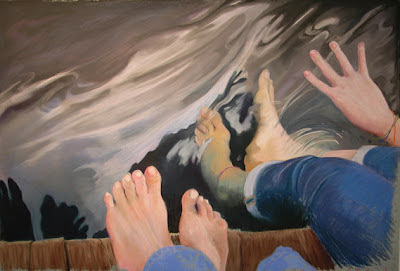 However Hands and Feet is among the largest pastels on the website at about 76 x 111 cm. Bio: Katherine Tyrrell is a qualified teacher with a degree in education from Cambridge University and an MBA from the London Business School. While her two degrees have nothing to do art, she has taken workshops with a number professional artists in the UK (Paul Riley, Paul Millichip, Peter Welton, Jackie Simmonds, Jeremy Le Grice and Wynn Jones) and latterly in the USA (Sally Strand, Dianna Ponting). She has also attended part-time courses and is an alumnus of Central St Martins College of Art and the Prince's Drawing School in London. Katherine Tyrrell is an artist who enjoys drawing, writing and sharing information about art. Making A Mark is #3 in the top 25 art blogs in the UK. In 2009 she became a signature member of UKCPS (United Kingdom Coloured Pencil Society). She is also a past member of the SGFA (Society of Graphic Fine Art) Council. Currently she is a member of two sketching groups - the Drawing London Group and the RWS Friends Sketching Group and in 2009 she founded an art community called Sketchercise. Katherine has had work accepted into juried annual exhibitions of national art societies and group exhibitions in the UK, the USA and Canada. Her work is in private collections in the UK, Australia and the USA. Subjects: Landscape; Flowers; Still Life. Style: Representational. Kathreine says: Although much of my work in the past has been rooted in loose realism, I'm increasingly interested in abstracting the patterns and shapes I come across in the natural world at either end of the scale .... I very much enjoy working from life and in public places - as you can see from my sketchbook pages. Much of my figurative work is either initially developed or completed in front of the subject. All my drawings of people are from life and I very much enjoy observing and recording the way people relate with one another in different places. Navigation: Links remain available at side of page. DO NOT click on an image to access a gallery from home page – they are not hyperlinked, despite the legend above them. Instead, use the menu at the side. However, in the subgalleries, these image links are active. Gallery: Places; Flowers and plants; Small works; Still life; Life. (Note: there are subgalleries within these categories). Image View: Galleries open in new page. Thumbnail images are enlarged in a viewer; download is possible. Information is provided on medium/dimension. 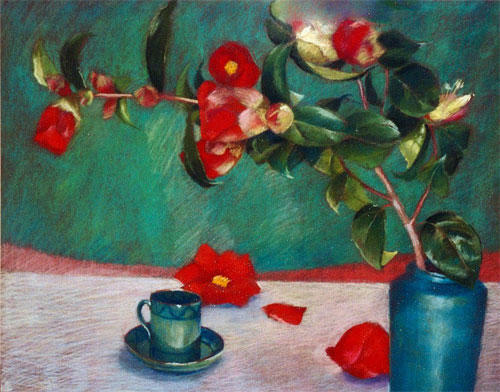 Devon Camellias is 19.5 x 25.5 ins, 500 x 392, 49 KB. A consumer's guide to quality and value in art books, art supplies and services to artists. Read reviews about art books, art supplies and other products and services used by artists. Bio: Joe MacKechnie grew up in the Pacific Northwest and worked as a computer network design engineer in the Seattle area for many years. When he retired, like many before him, Joe pursued a career in fine art. He continues to develop his skills, techniques and style in all mediums and has received many awards for his work. His pastel painting, Wild Turkeys, won an Honorable Mention in the 11th Annual Pastel 100 Competition. Joe is a signature member of the NW Watercolor Society and the Puget Sound Group of Northwest Painters, of which he is past president. 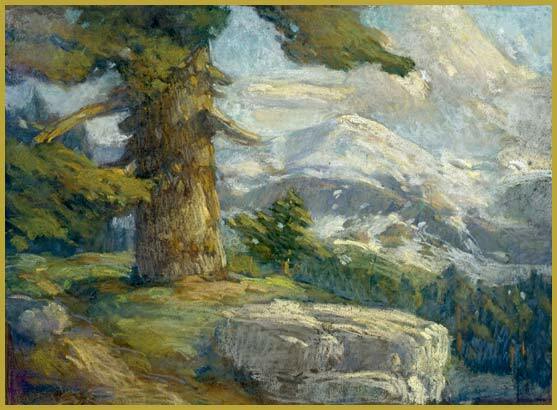 He is also a member of the National Pastel Society, Oil Painters of America, and is a past president of the Eastside Association of Fine Arts. Medium: Pastel, watercolour, acrylic, oil. Subjects: Landscape; Figurative; Animals; Still Life. Gallery: New Artwork; Sports Art; Other Living Things; Portraits; Landscapes; Maritime (no pastels); Floral (no pastels); Native American Fine Art; Still Life (no pastels); Figurative; Vietnam Trilogy. Image View: Thumbnail images are tagged with information on medium and dimension on mouseover; they enlarge in a new page and can be zoomed; download is possible. Dash to the Finish is 32 x 25 ins, 550 x 393, 242 KB. Blog: Yes – more a travelogue in verse than an art odyssey. taking workshops with master painters. That, she explains, along with thousands of hours at the easel and the study of past masters of the Grand Creative Tradition of painting, is the lineage which orchestrates her sincere efforts as a painter. Remley Martin is a Signature Member of the Pastel Society of America, Audubon Artists, Inc., the Pastel Society Of The West Coast, the Degas Pastel Society and Distinguished Member of the St. Louis Artists’ Guild. 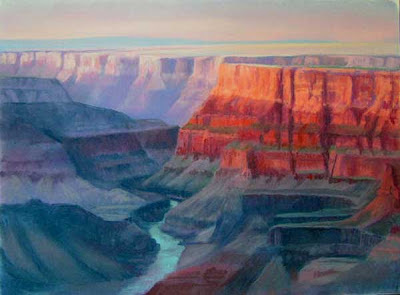 She has been the recipient of numerous awards for over a decade, including the Gold Medal Of Honor Award, Audubon Artists Inc. 66th Annual Exhibition 2008, and Best Of Show Award, Chicago Pastel Painters 2009 Biennial Exhibition. Style: Representational. Martin is a master of colour. Gallery: Oils, Pastels, Plein Air. Image View: Thumbnail images are enlarged in a slideshow; a download button is provided. Information is generally, but not always, provided on dimension and medium of original. The Pastels gallery is self-evident. Tupac Pots in a Wagon is 18 x 24 ins, 700 x 527, 108 KB. Blog: http://www.remleymartin.com/Site/Blog/Blog.html but not updated since 2010. Demo: There are four QuickTime movie clips on the site. Bio: From policeman to artist is an unusual pathway. 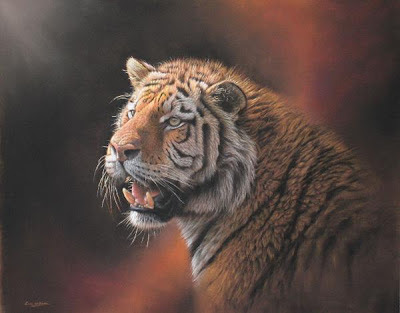 Eric Wilson became a police constable in 1979 but turned professional wildlife artist in 1991. His childhood in the Scottish highlands imbued him with a love of nature and he has travelled the world to paint its wild inhabitants. Photographs on their own are never sufficient to express a close encounter. Eric has exhibited widely in London, Germany and the United States, exhibiting at the prestigious Florida Wildlife and Western Art Exposition and The National Exhibition of Wildlife Art where his work has won several awards. His paintings have appeared in magazines and books such as The Best of Wildlife Art and Keys to Painting Fur and Feathers, by North Light Books; I spotted him in the 2010 Pastel edition of Pratique de Arts. Eric is often to be found as Artist In Residence at the Nature Art Museum in Twigworth, Gloucester. Eric lives in Derbyshire with his artist wife Karin Momberg. Navigation: Generally easy - links tend to remain visible on top of page. Home page is probably the most confusing. Gallery: There is a list of images by species, but other links are scattered throughout the page home page, including New Work. The page is not nearly as organised as the paintings, even though the artist has been on the web for fourteen years. Image View: Images are sizable and download is possible. Information is generally provided on dimension and medium of original. Amur Tiger is 24 x 19 ins, 600 x 469, 33 KB. Bio: French pastellist Laure Peyroux was born in Cannes, and now lives in the region of Montpellier. She is self-taught, but has been drawing since childhood. She has been entering competitions since 1992, and has had shows from the south of France –Cannes, Nimes, Marseille, Lyon, to Paris, and as far north as Lamballe, Côtes d’Armor (Brittany). Medium: Pastel. Between drawing and painting, nothing can translate emotions with such delicacy, finesse and sensitivity, as pastel - its vibrant hues and vibrant dazzle us and seize us by its wealth of color, shading effects, its gradients and blended tones...I do not know how to use a brush, I can not detach myself from these sticks. They offer unique moments to mingle and become entangled, melt and coalesce, come together and marry, integral with the artist who is the alchemist. Subjects: Portraits, figurative. "My favorite theme is the portrait, extended to representations of women, these women I chose, especially the face with its expressions and enigmas, its features and its eyes." Admirative des jeux d’ombre et de lumière du peintre Georges de la Tour, et du travail très minutieux du peintre William Bougereau, ces maîtres ne feront que conforter son choix et son goût pour le figuratif. Particulièrement intéressée par la physionomie expressive, son travail se veut dans un premier temps, axé sur le portrait pur ; et les peuplades auront pendant longtemps sa préférence. Pour y parvenir, le pastel va être un précieux allié, sa sensualité et ses couleurs vibrantes vont permettre un rendu inégalé. Aujourd’hui, elle s’oriente vers un travail un peu plus fouillé, toujours mêlant figuratif et expression, mais traitant de sujets qui la touchent dont les messages sont distillés à travers des symboles imagés. Style: Representational. Peyroux likes to use chiaroscuro to attract attention by the play of contrasts, in order to highlight the emotion and the expression of the characters. 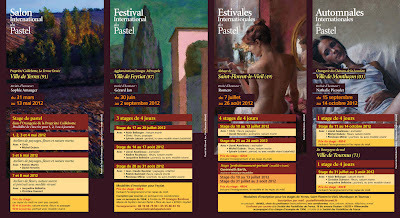 Navigation: The website is in French but the links remain visible and the gallery pages are self-explanatory. Image View: Thumbnails enlarge in Adobe Flash viewer on same page. Download is not possible. Information is not provided on dimension of original. But I have seen a photograph of the artist next to one of her paintings, and they are sizable. Bio: Kippy Hammond graduated with a BFA from the University of Georgia. She studied pastel and oil portraiture with Daniel Greene, Kate Fetterolf, and Constantine Chatov. 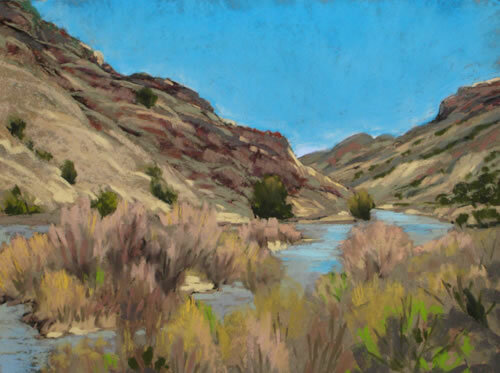 She has taken pastel workshops with Kay Polk, Alan Flattman, and Albert Handell. Kippy Hammond’s work has been recognized in numerous exhibitions and solo shows receiving national and international awards. 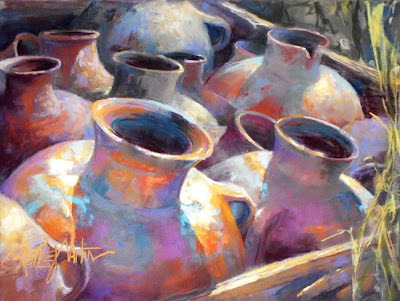 Hammond was a demonstrator and lecturer at the International Association of Pastel Societies Eighth Biennial Convention in 2009 and 2011. She is a signature member of the Pastel Society of America and the Southeastern Pastel Society and a former Salon International du Pastel international guest of honor. Kippy Hammond has been a full-time art teacher for middle school, as well as being Artist in Residence for the Georgia Council of the Arts. She is co-founder of the Hammond-Boyd Art School. 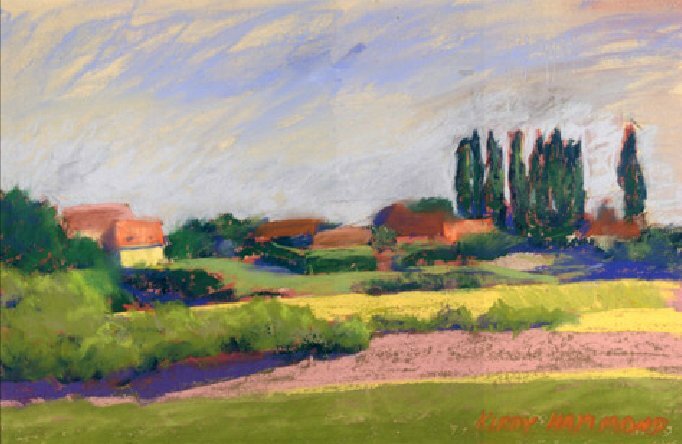 Presently living for the majority of the year in France, Kippy continues to paint landscapes and commissioned portraits for clients in the United States and Europe, offering pastel exploration workshops in France and through art facilities in the United States. She and Jerome Henriquez serve as directors and hosts at La Bonne Etoile, 60 miles southeast of Paris, in the small village of Fontaine-Fourches. Subjects: Landscape, Portraits, Still Life. Navigation: Gallery links remain visible at all times while viewing artwork. Gallery: Numerous subgalleries, including Still Life and Oils – so presumably the rest of the paintings are in pastel. Image View: Thumbnails enlarge in Adobe Flash viewer on same page. Download is not possible. Information is not provided either on size or medium, although I expect the oils are confined to the Still Life and Oils gallery. 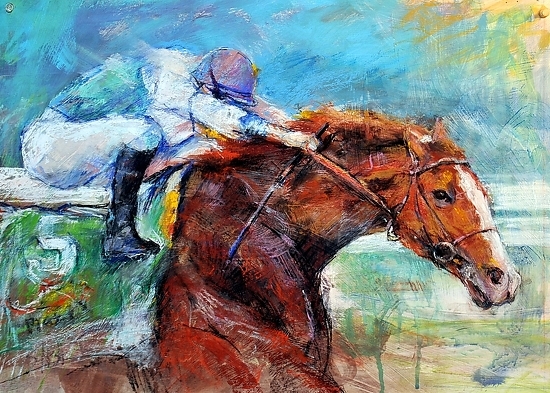 Bio: Ohio artist Andrea Starkey has been a commercial artist since 1990. She finds inspiration for her artwork from both nature and the natural materials used in its creation. She took up pastels in 2004, and dropped the “commercial” in front of “artist” in 2009, when she began to show her work. She has since been selected for The View 2009 - A Juried Landscape Competition which is open to all Ohio artists, and she won an award in the 2010 Pastel 100. Medium: Pastel, printmaking, computer graphics. Gallery: Pastels (Landscape; Abstract; Portrait; Architecture); Prints. Image View: Thumbnails enlarge in viewer on same page. Download is possible. Information is provided only in the Portrait and Architecture subgalleries. Bio: Claude Bauret-Allard , was born in Thonon-les-Bains, Haute-Savoie, and raised in Savoie in a family of artists. She is married to Jean-François Bauret, a photographer, and lives near Paris, in Place de l'Eglise, in Fontenay . Their two children are also artists. Bauret-Allard has been painting for over forty years. 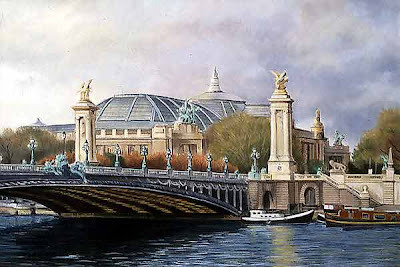 She exhibited in 1963 at the Salon des Réalités Nouvelles, and since then she has held numerous shows both in France and in the United States. Bauret-Allard blends soft pastel to create her atmospheric landscapes. Fine detail is created with pastel pencils, especially when working on her finely wrought studies of mouldy fruit or metal cans. "Pastel is a very delicate medium to use," says Bauret-Allard. "Some painters consider it impossible, much too difficult and time consuming.”Bauret-Allard was featured in a special pastel edition of Pratique des Arts, in 2010. Medium: Pastel. Pastels Henri Roché, the brand favored by Claude Bauret-Allard is widely regarded as remarkable for its quality. 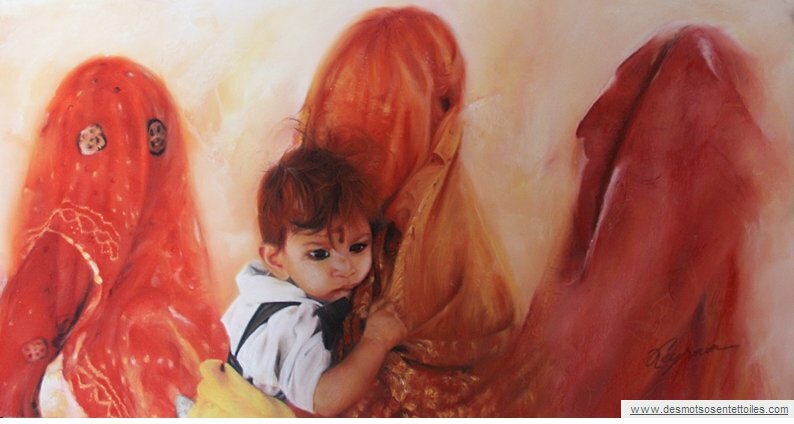 "I painted with all types of mediums until I discovered these pastels and became ‘addicted' to them," states the artist. "The color range is enormous and the texture corresponds totally to my needs." Subjects: Landscape, still life. She tends to paint in series. Style: Her vision is personal and not aligned to any established school. The light in her work has been compared to that in Turner and Friedrich. 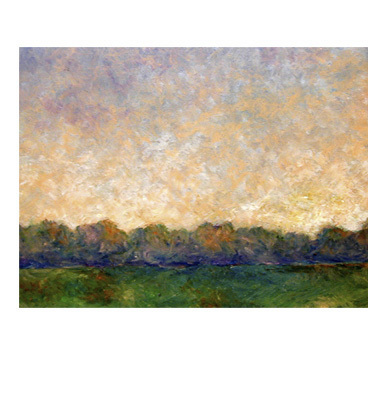 The interpretation varies from almost photoreal to impressionistic to even expressionistic, depending on the subject matter. “When I paint a large landscape, I use a smoother, more classical paper which will not interfere with the image and I use the pastel as a pigment, more than as texture." "The mould series developed after I did a vegetable garden and kept the cucumbers, squashes etc for their beautiful shapes. As they aged and moldered, I saw a new world in this extraordinary 'second life.' I started to look at what happens on some fruits and I discovered magnificent changes on lemons, oranges, pears or quinces. To fully express this process I use a thick paper which gives an interesting texture. Pastel is the perfect medium to translate the moulds; powder to represent powder, and for the details, I use pastel pencils which allow me to keep the sharpness of the drawings. It's the same thing for the 'can series,' the rust is also breaking down to powder and the shape, as it is for the moldering fruit and vegetables, is in continuous transformation." Navigation: This website is in French. All galleries open on a new page with no links thereon. Gallery: Arbres (trees); Bidons (container); Espaces (spaces); Floral; Moisissures (moulds); Paysages(landscapes); Paysages Urbains (townscapes); Petits Formats (small formats). Image View: All images are presented with a single view. The size variesL think large thumbnails. Download is possible. Information is provided on dimension of original work. 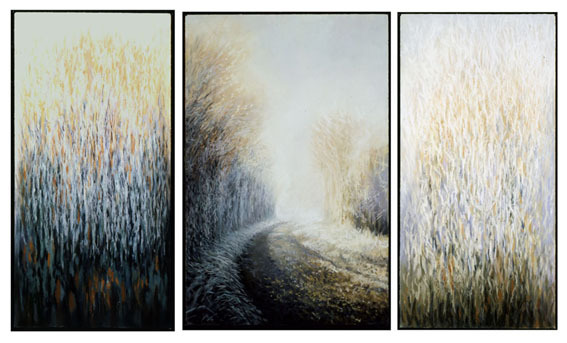 The tryptich Frost is 112 x 188 cm. and is one of the larger images on the website. Demo/Blog: No. There is an informative interview with the artist on the website of the TewGalleries, Atlanta, USA. Bio: Dutch artist (a first for this blog) Corry Kooy (born October 19, 1960) lives and works in Schoonhoven. She attended drawing and painting training in England and participated in various master classes in England and the Netherlands. Her work is regularly exhibitions and is represented by several prominent galleries. She has won prizes in England and the Netherlands, including the Cross Gate Gallery Award, London, 2000, and the Frank Herring Award, London, 2001. More recently, she carried off the Green Heart Art Prize, Nieuwkoop, 2007 with a pastel of newborn calf. In 2007, the book Corry Kooy: Schilderen in Pastel en Olieverf (Corry Kooy: Painting in Pastel and Oil) was published. Style: Nice loose, painterly style. Kooy is not shy about using a full colour palette. She does not seek a photographic representation of reality. "I prefer to work on location; from movement and emotion of the moment I reach something different than when I take a picture and I paint that later....Often those moments are determined by the light. If the earth has warm colouring and there are long shadows, then I stop and grab my sketchbook. Or when I suddenly see a mysterious shadow of a palm tree on a closed door, I immediately want to convey that on canvas or paper." Navigation: This website is in Dutch and in English. Links generally remain on top of page. Gallery: Dieren (Animals) ; Portretten (Portraits) ; Modellen (Models), Stad en Land (Town and Country), Muziek en Dans (Music and Dance), Interieur (Interior); Schetsboek (Sketchbook). Image View: There are no thumbnails. All images are presented as a slideshow. No information is provided on medium or dimension of original. If you go to this page and scroll down to bottom you will find a filmed interview in English that Corry did with the Cambridge Art Academy. 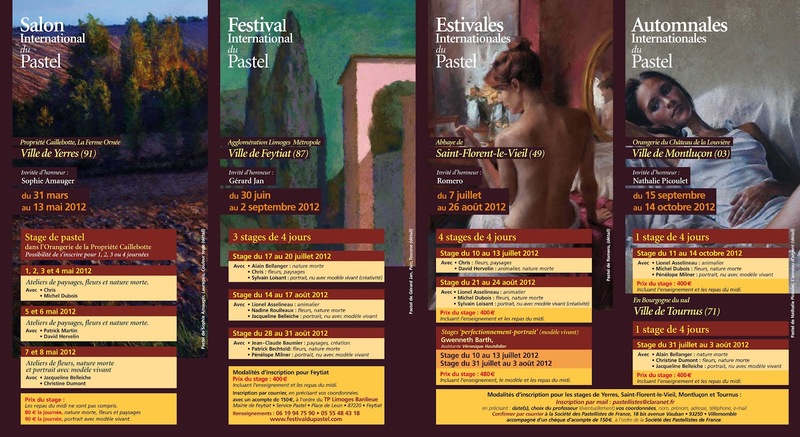 The French Pastel Society, or Société de Pastellistes de France, has just issued their programme for 2010. Events will be staged in Ville d'Yerres, Feytiat, Saint-Florent-le-Vieil, Montluçon and Ville de Chaville. 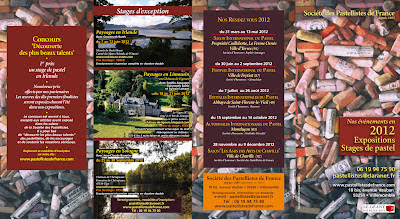 Look for the legend A RETENIR - CONCOURS, click on the word suite > >, and click on Reglement de concours et bulletin d'inscription on the bottom of the left hand column. This will bring you to a page with a choice of 5 pdf documents to download. You need the single document in the centre row of the table. Alternatively, this link will bring you directly to the pdfs. Bio: I must thank Margaret Zayer of Pastels Henri Roché for pointing this website to me. Pierre Boncompain was born in 1938 in Valence, Provence into an educated family where an interest in all of the arts was nurtured from a young age. In 1959 he entered the Ecole Nationale des Arts Décoratifs and in 1963 the Ecole Nationale des Beaux-Arts where he won the Prix de Collioure. He was selected for the 1970 Prix Charles-Paquement des Amis du Musée d'Art Moderne, Grand Prix de la Critique. A 1972 residence at the Fondation du Château de Lourmarin was followed in 1977 by a cultural mission to India with the writers Michel Tournier and Robert Sabatier. Over the years that followed he built an international reputation as one of the most promising post-School-of-Paris artists, with exhibitions and retropspectives in Paris, Lausanne, Milan, London, New York, San Francisco, Tokyo, Kyoto, Osaka, Beijing, and Shanhai. In addition to his permanent presence on the walls of Artfrance in Paris that has presented a major solo exhibition of his works every three years since 1976, Boncompain has exhibited frequently elsewhere in France and abroad. He is currently represented in New York, Tokyo, Vallauris, Dieulefit, Hong Kong, and Aspen. In 2002 he was commissioned by Johnson and Johnson to paint a large mural at their headquarters in Hamilton, New Jersey. Publications: Boncompain has published a number of monographs and catalogues raisonés, and illustrated works from the Canticle of Canticles, to Alexander Solzhenitsen. As Georges Borgeaud has remarked in his book about Boncompain, "fruits and flowers provide an Epicurean feast for the eyes and the spirit, the distant mountains let us know that the slopes which we see in the picture are caressed by Mediterranean light". Medium: Pastel, ceramics, tapestry. 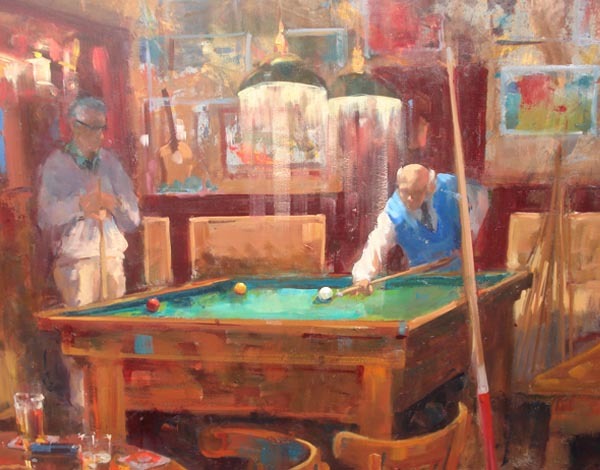 It is not simply Boncompain's choice of subject that sets him apart, but his bold use of color. 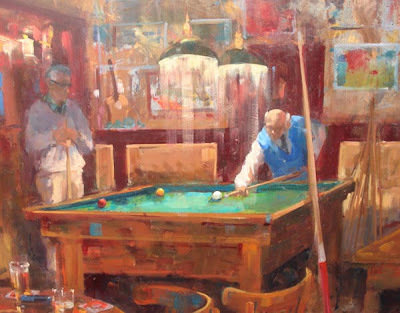 Whether in oil or pastel, Boncompain is the quintessential colorist. As Michel Deon commented, "we do not speak in front of his pictures, our attention captured by the peace it is steeped in, this longing for Summer, these haunting blues, these ochres and these yellows of Provence, this festival of light, good taste and discretion". Subjects: Figurative, interiors, landscape, still life. His figurative works depict beautiful women in languid poses or enjoying a siesta while evading the heat of the Provence afternoon. His figures do not confront the viewer, but gaze off in the distance, lost in a daydream or lost in the dream world of sleep. 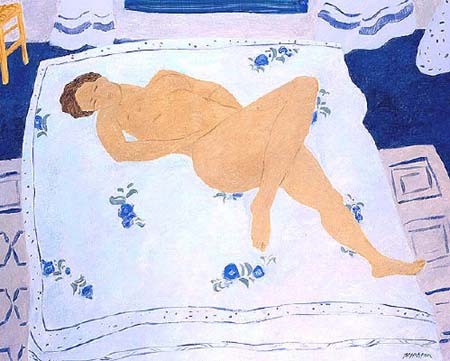 The sensual line that winds its way through the form of the female figure is reminiscent of the works of Matisse. Navigation: Links generally emain on top of page. Gallery: Retrospective: Figures, Nus, Intérieurs, Paysages, Nappes et batiks, Bouquets, Nourritures terrestres. Image View: Thumbnails enlarge in viewer and may be saved. No information on dimension.